Description: White cloth with the text XII OLYMPIAKISAT HELSINGISSÄ 1940. 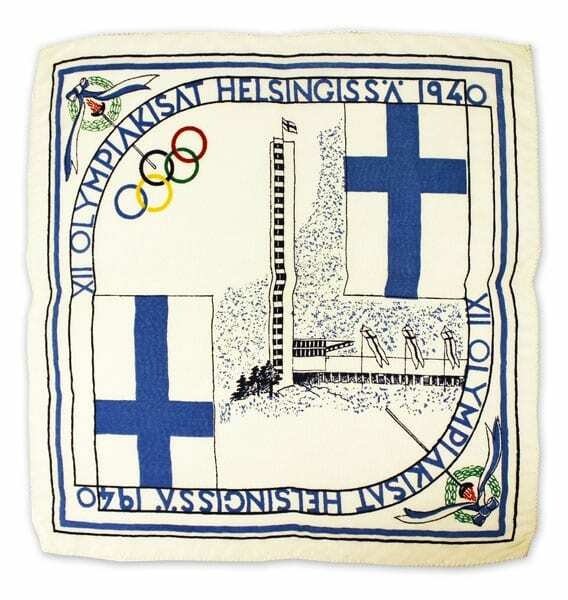 Two Finnish flags, part of the Olympic Stadium with the tower, Olympic rings, two laurel wreaths and two Olympic flames. Other information: Also made with the text: OLYMPIAKISAT HELSINGISSÄ 1940 XII OLYMPISKA SPELEN I HELSINGFORS 1940.